Whether you were waiting for New Year to really galvanise yourself into losing weight, or you’re under doctor’s orders to shift a few pounds, my NEW 5:2 could be just what you need. When I first wrote The Fast Diet with journalist Mimi Spencer, back in 2012, millions around the world fell in love with the idea of losing weight by ‘being good’ for two days a week and eating normally the rest of the time. Many people found it easier to diet this way, rather than with the standard ‘slow and steady’ method. I originally put together the 5:2 diet after talking to scientists about the potential health benefits of intermittent fasting. I decided for five days a week I would eat healthily, and on my two fasting days I would cut down to 25 per cent of my normal intake — around 600 calories a day (500 calories for women, who have lower daily calorie needs). I was amazed by how effective 5:2 proved to be. I think one of the main reasons people swear by it is down to its flexibility. Unlike many other diet plans, you don’t have to give up eating lots of food groups (such as carbohydrates) or buy expensive ingredients. In fact, it will save you money! This early version of the 5:2 diet was, I think, pretty good. However, the science of nutrition and health doesn’t stand still, and over the past six years there has been a wealth of fascinating new research into different forms of fasting and intermittent dieting. That’s why I’ve made some changes to my original 5:2 plan to make it easier to stick to. It also gives the option to start it with a fast-track 800-a-day regime. Follow it and hopefully you’ll boost your mental and physical health, as well as lose a few inches from your waistline. 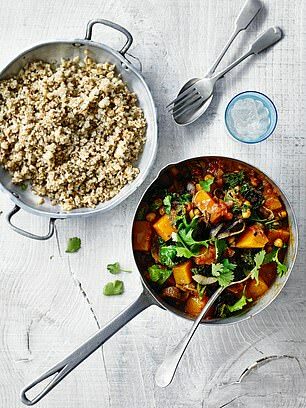 In Saturday’s Mail, I launched The Fast 800 diet with a 32-page magazine packed with tasty, healthy recipes, many created by my wife, Dr Clare Bailey. Today, I will focus on the core 5:2 element of my new, improved plan. 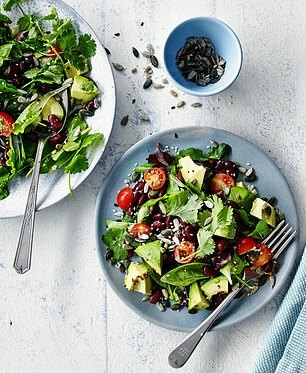 Every day this week I will reveal more about the health benefits of the multi-faceted approach of my Fast 800 plan, featuring nutritious recipes created exclusively for Mail readers. 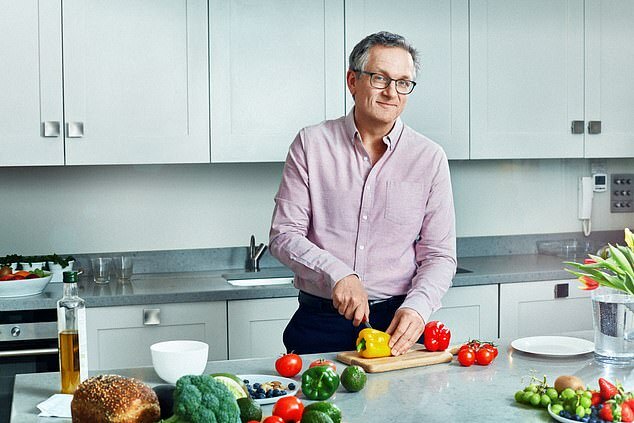 As I explained in Saturday’s magazine, on my new plan you can choose whether to fast track your diet and spend two weeks (or more) on 800 calories a day, or ease in more slowly instead. If you choose the 5:2 route, you will pick two days in each week to ‘fast’ on 800 calories, then eat an abundance of delicious Mediterranean-inspired food on the remaining five days. So what happens when you start fasting? During the first 24 hours of a fast, big changes occur inside your body. Within a few hours, the levels of sugar (glucose) circulating in your blood will begin to fall. When it’s not replaced by food, your body will start looking for energy in the form of glucose that is stored in your muscles and liver, called glycogen. But once stores of glycogen begin to run low (around ten to 12 hours after your last meal), your body switches into fat-burning mode. It’s called ‘flipping the metabolic switch’. When this happens, fat is released from your fat stores and converted into fatty acids and ketone bodies. This process is called ketosis. Your brain will use these ketone bodies as a source of energy. The longer you can avoid sugar and cut back on carbohydrates, the longer you should be able to preserve this ketogenic fat-burning state — that’s why many of my recipes in this series are lower in carbohydrate than you might expect. The key to both approaches is the idea of consuming 800 calories, which studies have shown is just the right amount to trick your body into a fasting state, without being so low you end up wishing you weren’t dieting at all. On your ‘fast’ days, you just need to keep an eye on your calorie intake. You can choose to have either three small meals per day or two larger ones (skipping breakfast or dinner) as long as the total calories add up to 800. I’m also urging you to try Time-Restricted Eating (TRE), where you eat within a shorter time window. Studies also show if you extend your night-time fast to 12 hours or longer, and crunch your eating time into fewer hours, you can reap even more of the health benefits of intermittent fasting. So, if you start on the fast-track 800 calories a day plan, I advise you eat those calories over a 12-hour window (say between 8am and 8pm) and then go 12 hours without food. Stick to the plan and you could lose up to a stone in three weeks. 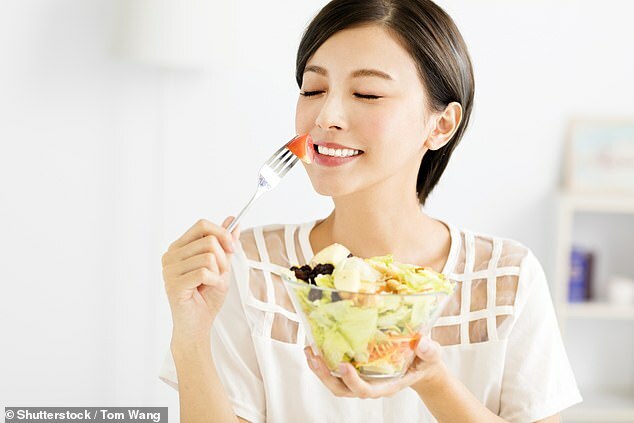 But if you decide to do the NEW 5:2 and restrict your 800-calorie days to two days per week, I think it’s a good idea to apply a little extra TRE, and eat within a ten-hour window (say 8am to 6pm, or 11am to 9pm) on your fast days. If it seems easier, this can mean skipping breakfast and enjoying two slightly larger meals rather than three small meals. For the 800-calorie fast days, you can use the low-calorie recipes in this series. 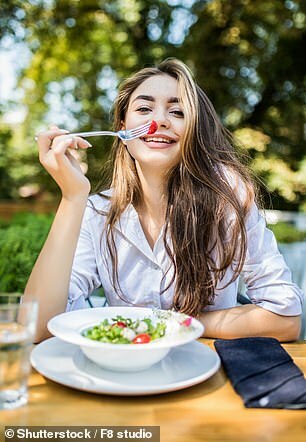 On other days, you can eat normally but healthily, sticking to a Mediterranean-style diet low in carbohydrates and refined sugars, without having to count calories. On this version of the plan, you could lose 1-2kg a week. Rapid weight loss used to be described as ‘crash dieting’, but the research now shows it can be safe and sustainable. 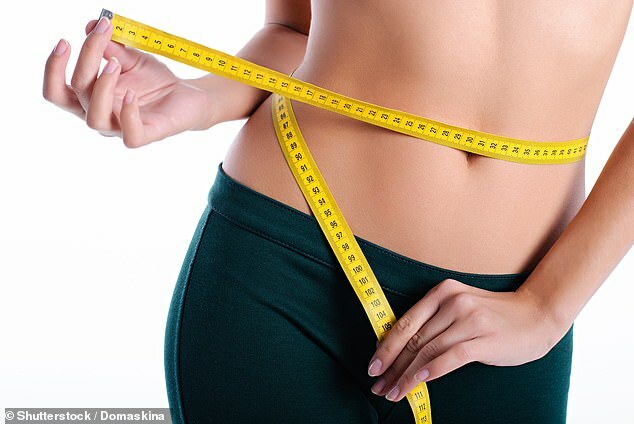 In fact, people who lose weight quickly are more likely to keep it off. You can stay in this fast-track phase for up to 12 weeks — but if you have any medical problems, check with your GP beforehand. This diet is not suitable for under- 18s, or if you’re breastfeeding, pregnant or undergoing fertility treatment. Neither is it for those who are underweight, have an eating disorder or psychiatric disorder, have had recent heart problems or uncontrolled heart disease or high blood pressure. Check with a doctor if you are unwell or recovering from significant surgery, or have diabetes, retinopathy or epilepsy. 1. Take a medium saucepan a third full of water and bring to a gentle simmer. Break the eggs into two cups, then carefully tip them, one at a time, into the pan. Immediately take off the heat. Leave to stand for 4-5 minutes, or until the whites are set and the yolks remain runny. 2. 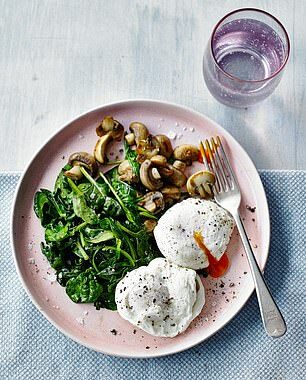 While the eggs poach, melt the butter in a non-stick pan (or alternatively, use olive oil) and fry the mushrooms for 3-4 minutes, or until lightly browned. 3. Add the spinach and toss with the mushrooms until just beginning to wilt. Don’t over-cook or lots of liquid will be released. Season with pepper and a pinch of salt. Put the mushrooms and spinach on a plate. Drain the eggs with a slotted spoon and place on top. Season and serve. 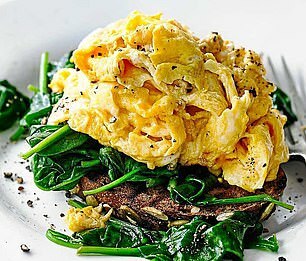 THIS fabulous light breakfast is full of flavour. 1 Cut or break off the woody ends of the asparagus and blanch the spears in a pan of boiling water for about 3 minutes. Drain, pat dry with kitchen paper and set aside. 2 Heat a pan of water to a rolling boil. Add the eggs and cook for 6-7 minutes for a soft yolk. 3 Meanwhile, heat a griddle pan on the hob. Toss the asparagus spears in the olive oil and sprinkle them with the cumin or paprika, salt and black pepper. Cook on the griddle for 3-4 minutes, turning a few times, until they are tender and slightly charred. 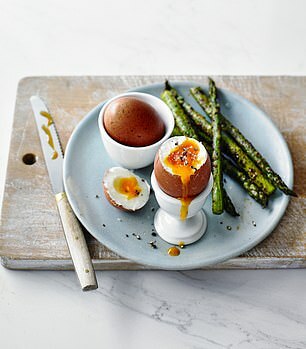 4 Serve the boiled eggs in egg cups, with the griddled asparagus on the side for dunking. MORE SUBSTANTIAL: (Calories per person are shown.) Add a large handful of spinach, tossed for about 1-2 minutes in a non-stick pan until it wilts (insignificant calories; add 37 calories if you fry the leaves in 1 tsp butter, or 27 calories for 1 tsp olive oil). Or add a large handful of mixed salad (no extra calories, unless you add a dressing, such as olive oil and cider vinegar). 1 Put the plums in a saucepan. Add the orange zest and juice, 150ml water and cinnamon. Stir lightly. 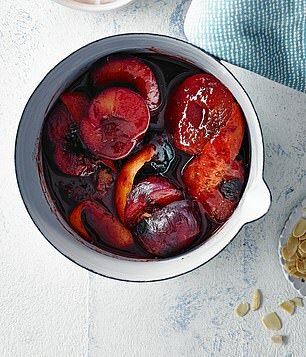 2 Bring the liquid to a simmer, cover and cook over a low heat for 10-15 minutes, or until the plums are soft but holding their shape. 3 Serve warm or cold with Greek yoghurt and a sprinkling of toasted almonds. 1 Toss the beans, leaves, tomatoes, spring onions and coriander together. Place the avocado on top. 2 Whisk the lime juice, oil and mustard together. Season with salt and pepper. Drizzle the dressing over the salad, sprinkle with the seeds and serve. 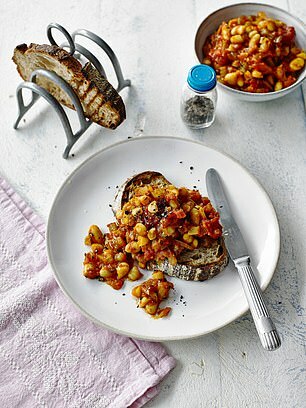 A WHOLE-FOOD, home-made, low-sugar beans on toast. 1 Heat the cumin and coriander seeds in a medium, non-stick saucepan for 1-2 minutes to release their aroma, then add the oil and sauté the onion and celery for 2-3 minutes, until starting to soften. 2 Stir in the remaining spices and cook for 30 seconds more before adding the tomatoes, 150ml water and the balsamic vinegar. Simmer gently for 15 minutes, stirring occasionally. 3 Stir in the beans, add 1-2 tbsp water to loosen if needed and season to taste. Cook for 2-3 minutes more, or until the beans are hot. 4 Meanwhile, toast the bread. Serve the beans spooned over the slices of sourdough. 1 Either poach the eggs in boiling water for 4 minutes or scramble them. 2 Meanwhile, melt the butter (or use oil) in a non-stick frying pan over a medium heat and add the spinach. Cook briefly, just until it wilts, then spoon onto the toast. 3 Place the eggs on top. Season to taste with a little salt and plenty of ground black pepper. TIP: For extra flavour, add a few drops of Tabasco sauce or a pinch of cayenne pepper. 1 Preheat the oven to 200c/190c fan/gas 6. Brush a baking tray or roasting tin with a little of the oil and place the chicken thighs, skin-side up, onto it. Season with salt and pepper. Roast for 10 minutes. 2 Put the onion, peppers and courgette in a bowl and toss with the remaining oil. Season with pepper. 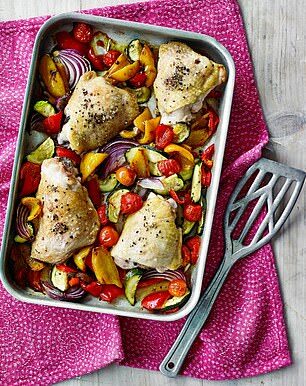 Take the tray out of the oven and scatter the vegetables around the chicken. Roast for 20 minutes. 3 Take the tray out of the oven once more and add the tomatoes. Squeeze the juice of the lemon over the chicken and vegetables. Return to the oven for a further 10-15 minutes or until the vegetables are tender and lightly charred and the chicken is cooked . 4 Serve the chicken and vegetables with the lemony cooking juices spooned over. 1 Preheat the oven to 200c/180c fan/gas 6. Line a small, shallow baking dish with kitchen foil. Mix the soy, sesame and chilli, if using. 2 Place the salmon fillets in the prepared dish or tin, skin-side down, and spoon over the soy sauce mixture. Scatter the spring onions over the top. 3 Season with ground black pepper and bake for 15 minutes or until the fish is just cooked through. 4 When the salmon has almost finished cooking, heat the olive oil in a large non-stick frying pan or wok and stir-fry the vegetables for 4-5 minutes, or according to the pack instructions. 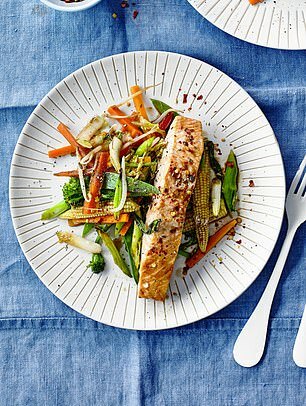 5 Divide the vegetables equally between two warmed plates or bowls and top with the salmon. Spoon over the soy cooking liquor and serve. YES, you can still enjoy curry . . . just skip the potato, white rice, naan and chapattis! 1 Heat the oil in a pan and fry the onion rings for 8-10 minutes or until golden and crisp. Remove from pan and set aside. 2 Using the same pan and oil, fry the chopped onions for 2-3 minutes. Add the butternut squash, garlic, red pepper and mushrooms and cook for a further 3-4 minutes. 3 Stir in the chickpeas with the rogan josh paste, followed by the tomatoes. 4 Cover the pan and let it simmer for 15 minutes, or until the vegetables are tender. Add water, if necessary, to loosen the sauce. 5 Stir in the kale and cook for 2 minutes, then add the coriander and season. Garnish with the onion rings and serve with Coconut Cauliflower Rice (Recipe to follow, add 105 cals). Q&A: What days should I fast – and will the weight stay off? Q: Should I start by doing 800 calories every day? A: The first decision you need to make is whether you want to start on the fast-track 800 calories-a-day diet, or the new 5:2 plan of 800 calories on two days a week. The answer depends on your motivation levels and how much weight you want to lose. The advantage of the fast-track option is, of course, that the weight loss will be dramatic, and that can be very motivating — but you need to be sure that you are comfortable about trying it. I suggest that you commit to this stage for two weeks, then reassess. Q: How do I choose my 800-calorie days? A: I am often asked whether it is better, when doing the 5:2, to do your 800-calorie days back-to-back or split them up. When I started out, I didn’t think it would make any difference which days I fasted, so I opted for Tuesdays and Thursdays. This was mainly a process of elimination. I didn’t want to curtail my social life by choosing Fridays or weekends. Monday fasts struck me as an unappealing way to start the week. When I initially tried doing my fasts back-to-back (Tuesdays and Wednesdays), I found it inconvenient, but it is a pattern I tend to follow now. In theory you may be better off keeping fasting days back-to-back if you can, because that helps you get the maximum fat-burning benefit of two days of calorie restriction, and your body should stay in fat-burning mode (ketosis) for the whole of the second day. Some people also find it more convenient to get their fasting over and done with in one go. You may, however, prefer to split your days. Just find a solution that works best for you. My only advice is that when you have chosen your days, try to stick with them week after week. Being flexible about your fast days could mean you are less likely to complete them. Q: When should I eat on an 800-calorie day? A: Everyone is different. When I’m doing the 5:2, I prefer to use up the majority of my calories in just two meals and put aside a few for a small snack. You can double up the quantities of ingredients in recipes or add extra vegetables for non-fast days. I have a late breakfast, skip lunch and aim to eat early in the evening. As you’ll see in this week’s pullouts, including today’s, our menus offer a huge choice. You can have three smallish meals — breakfast, lunch and dinner — or spread the calories over two larger meals. Try each approach until you the find one that works for you. Q: If I lose weight rapidly, will I put it back on as soon as I stop dieting? A: No. Studies that have run for more than a year show weight regain was no more a problem for those who lost weight rapidly than those who lost it gradually. In fact, rapid weight-loss dieters lost, and kept off, far more weight. An Australian study which put 200 obese volunteers on an 800-calorie rapid weight-loss diet for 12 weeks found that not only did they lose more weight than steady dieters, but four years later they were still leaner. Q: Does it matter what I eat if I stay under 800 calories? A: I strongly recommend you eat a Mediterranean-style diet rather than making up a diet for yourself. Please don’t even think about one of those crazy cabbage soup or green juice diets. Even though you’ll be eating less, you won’t be getting a good balance of nutrients. The menus in this series have been created to be safe and sustainable. Whatever you eat, it is vital that you get enough daily protein (at least 50-60g a day), otherwise you risk losing muscle. You also need to be sure you have a balanced mix of all the other essential nutrients. Q: Won’t my metabolism crash if I go on a rapid weight-loss diet? A: Fear of going into ‘starvation mode’ is one of the reasons so many people think diets, particularly rapid weight-loss diets, don’t work. This myth is based on the Minnesota Starvation Experiment, carried out during World War II, in which slim young volunteers lived on a low-calorie diet (about 1,500 calories a day) consisting mainly of turnips and potatoes. After six months on this very low-protein diet, when their body fat had fallen to less than 10 per cent, their metabolic rate (the amount of energy your body uses to keep itself going) crashed. But this was an extreme situation. More recent experiments on the effects of short-term calorie restriction have produced very different results. In fact, it has been shown that short-term fasting can have the opposite effect and actually boost your metabolic rate. Q: If I do put the weight back on, will I be worse off than before? A: No one who goes on a diet intends to put the weight back on, but it happens. When I asked Susan Jebb, professor of diet and population health at Oxford University, if that matters, she said, emphatically, no. ‘The harmful effects of obesity come from how big you are and from how long you’ve carried that extra weight. Even if you have a few years where you are lighter than you would have been, that brings very substantial health benefits,’ she says. She adds that you should weigh yourself regularly and, if you find you are regaining pounds, you should act quickly to stop it progressing. A few pounds can soon turn into a lot of pounds. Q: Should I avoid exercise on 800-calorie days? A: There is no reason to stop exercising just because you’re fasting. Exercise can help to burn fat and preserve muscle mass. But I wouldn’t recommend prolonged intensive exercise on fast days. I find doing press-ups and going for short runs is both possible and usefully distracting when I’m fasting. Being active is a great way of taking your mind off food, and will boost your mood into the bargain. Q: Can I do this diet if I’m a vegetarian or vegan? A: The abundance of vegetables and legumes in the recipes in this series make this diet ideal for a vegan or vegetarian lifestyle. Many of the dishes are suitable for both. Where possible, we suggest tips and swaps for vegetarians. However, do be aware that some vegan alternatives, such as coconut yoghurt, might be higher in calories than their dairy counterpart. Q: Do I need to take a vitamin supplement? A: The menus in this diet plan are designed to ensure that you get all the necessary minerals and vitamins. Nonetheless, you may, as a precaution, want to try a reputable brand of multivitamin and minerals, particularly on fast days. You might also want to take fish oil supplements from a decent brand. In normal circumstances I’m not a big fan of either, but it’s better to be safe. Q: How long should I spend on the fast-track before switching to 5:2? A: If you choose to kickstart your weight loss with my fast-track plan, it is entirely up to you when you move on to the new 5:2. You might find a couple of weeks of rapid weight-loss enough, or you might want to stay in the fast-track stage for longer. It depends on what you’re trying to achieve, and how you’re getting on. Either way, you should notice your hunger levels and cravings will be greatly reduced. You should also find you are feeling more energetic, lighter and brighter — and people will have begun to comment on how well you are looking! Switching over is straightforward and can be done at any point which suits you. Adapted by LOUISE ATKINSON from The Fast 800 by Michael Mosley, published by Short Books at £8.99. To buy a copy for £6.74 (25 per cent discount) go to this site or call 0844 571 0640. Offer valid until January 19, 2019; P&P free on orders over £15.